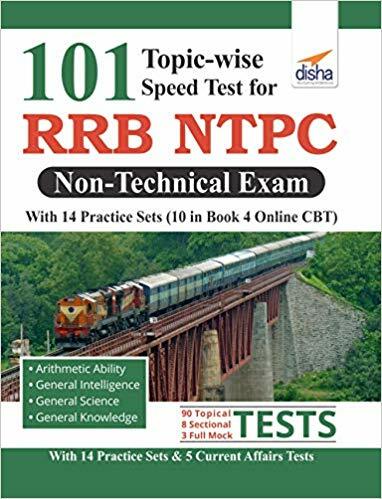 The Ultimate Practice Book - 101 Topic-wise Speed Tests for RRB NTPC Non Technical Exam with 14 Practice Sets (10 in book and 4 Online CBT) 2nd Edition covers questions on all the Important Concepts which are required to crack this exam in the form of 101 Speed Tests. No matter where you PREPARE from – a coaching or any Guide Book - 101 SPEED TESTS provides you the right ASSESSMENT on each topic. Your performance provides you the right cues to IMPROVE your concepts so as to perform better in the final examination. • The book is updated with 5 Topical Tests on Current Affairs. • 1st unique product with 101 speed tests – 90 Part Tests + 8 Sectional Tests + 3 Full Tests + 10 Addl. Practice Sets in Books + 4 Addl. Online Practice Sets. • Each Part Test is based on small topics which are most important for the Non Technical Exam. Each test contains around 20-25 MCQs (on the latest pattern of the exam) depending upon its importance for the exam. • The whole syllabus has been divided into 4 sections which are further distributed into 98 topics including the Topical and Sectional Tests. 1. Arithmetic Ability is distributed into 16 Topical and 2 Sectional Tests. 2. General Intelligence is distributed into 15 Topical and 2 Sectional Tests. 3. General Science is distributed into 35 Topical (Physics - 12; Chemistry - 13; Biology - 10) and 2 Sectional Tests. 4. General Awareness is distributed into 24 Topical and 2 Sectional Tests. • Finally at the end 3 Full Tests are provided to make it 101 Tests. • Additional 14 Practice Tests (10 in book and 4 Online CBT) are provided so as to give the candidates a real feel of the final exam. • The 4 Online CBT can be accessed through an Access Code provided in the starting pages of the book. • In all, the book contains 3750+ Quality MCQ’s in the form of tests. • Solutions to all the tests are provided at the end of the book. • It is our strong belief that if an aspirant works hard on the cues provided through each of the tests he/ she can improve his/ her learning and finally the SCORE by at least 20 percent.